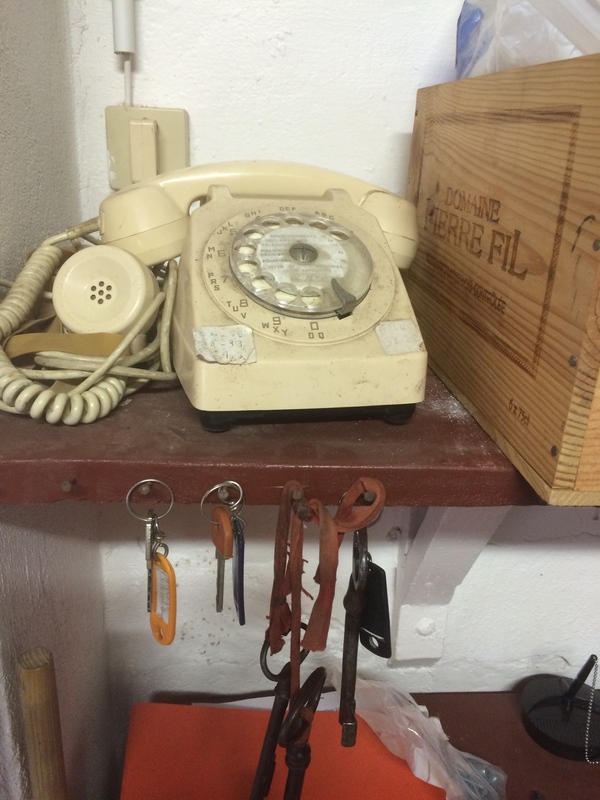 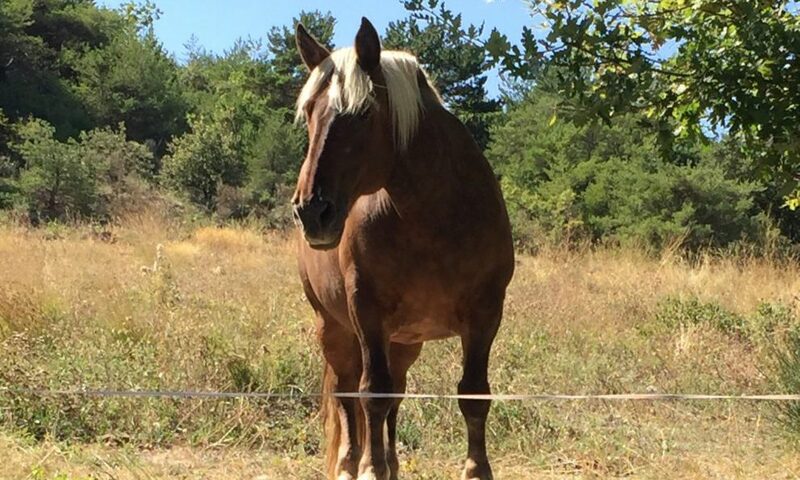 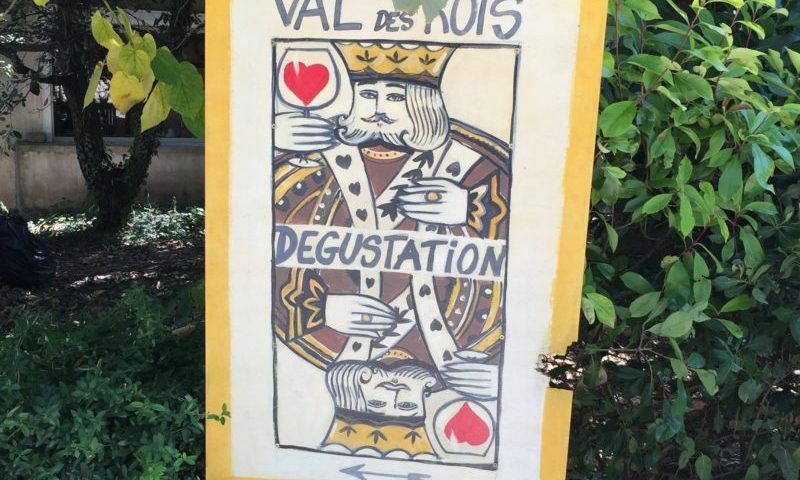 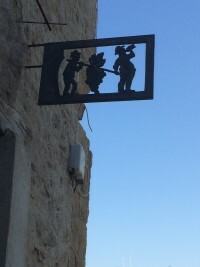 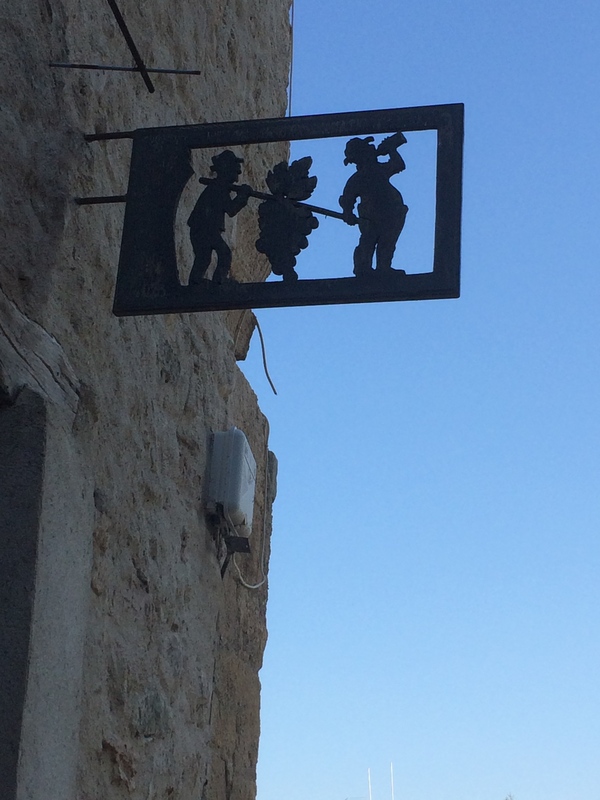 When we visit the Minervois, we love to meet the real characters and the passionate people behind the scenes. 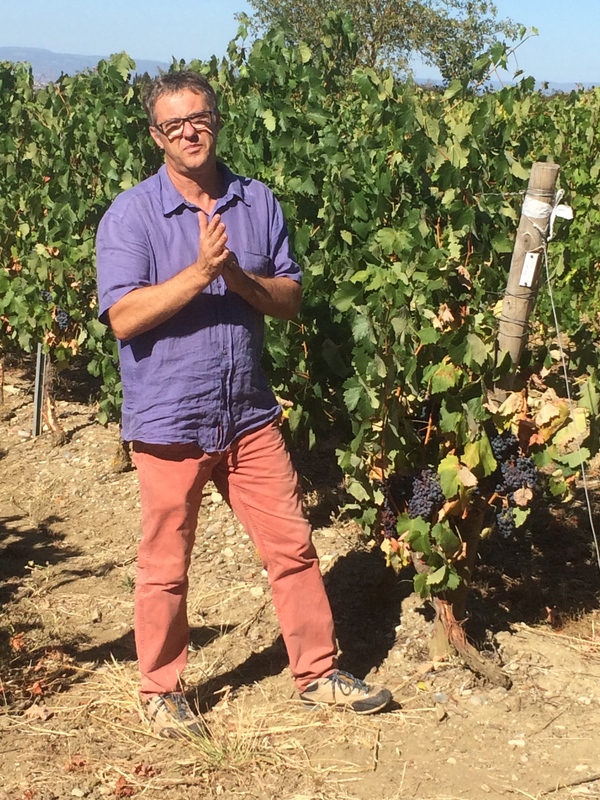 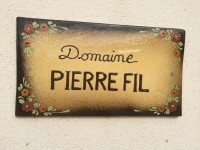 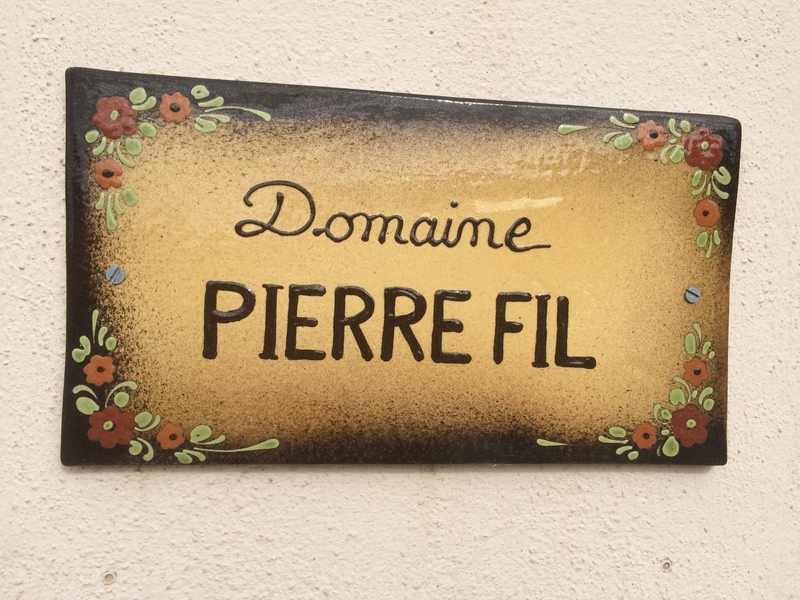 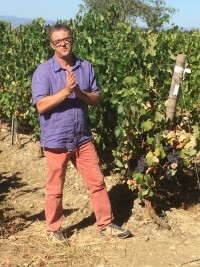 Today was no exception as we started our visit to Domaine Pierre Fil, three generations of wine makers and Pierre (father) regaled us with his stories from the vineyards and we met his son who explained some of the modern techniques they have adopted too. We love the ‘old school’ approach and think thay have got the balance just right. 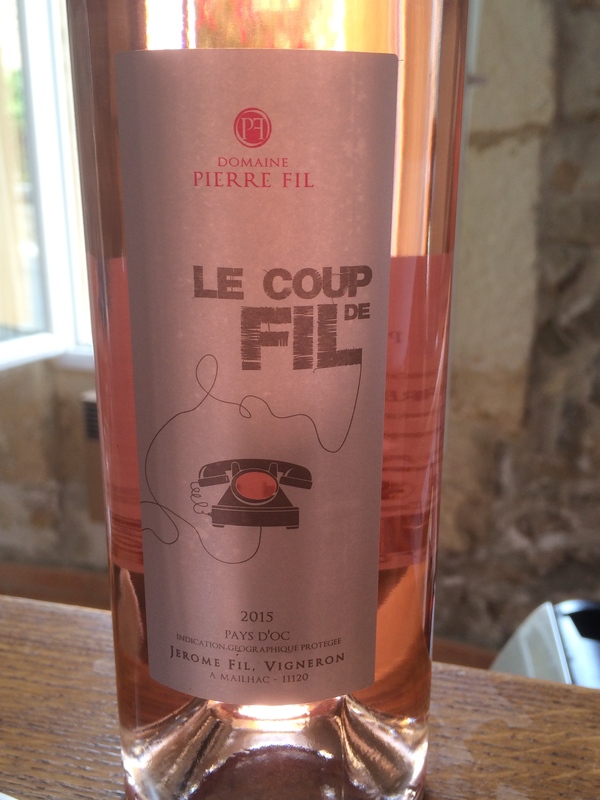 Their rosés were an immediate hit as were the amazingly priced reds. 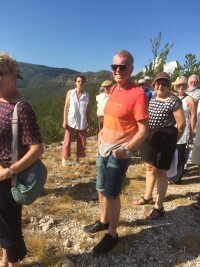 Purchases safely stowed in the bus, we headed off to the hilltop village of Minerve, situated in a limestone gorge, with a gory cathar history but luckily some great restaurants! Excellent lunch on the terrace followed, no doubt, by a siesta in the bus while we meandered through the high Minervois hills, with views towards the Pyrenees. 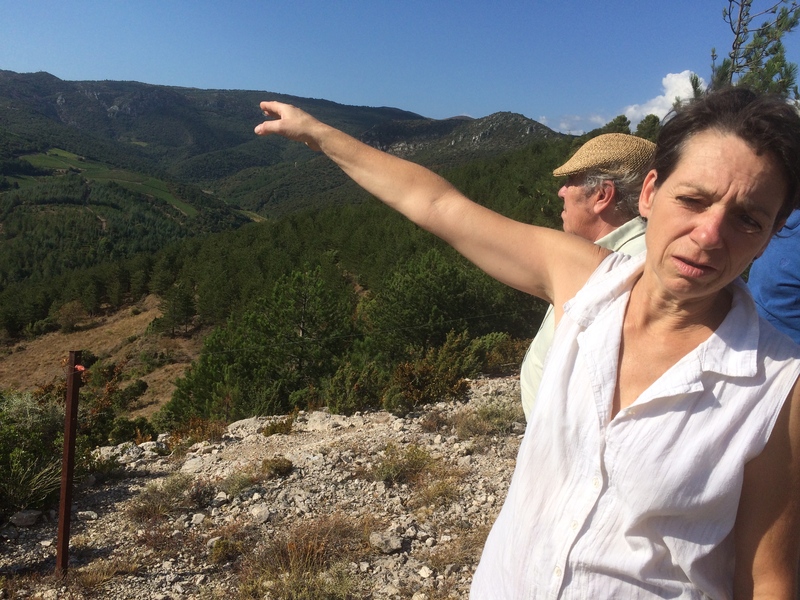 Here we met Irène Prioton, on a dusty track (my bus can get almost anywhere! ), where she showed us her small parcels of vines dotted around the hills. 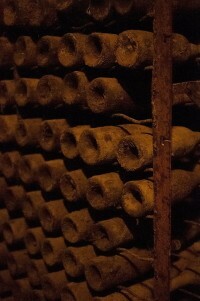 Back to her tiny cellar, where the word ‘artisinal’ , so often overused these days, really applies. 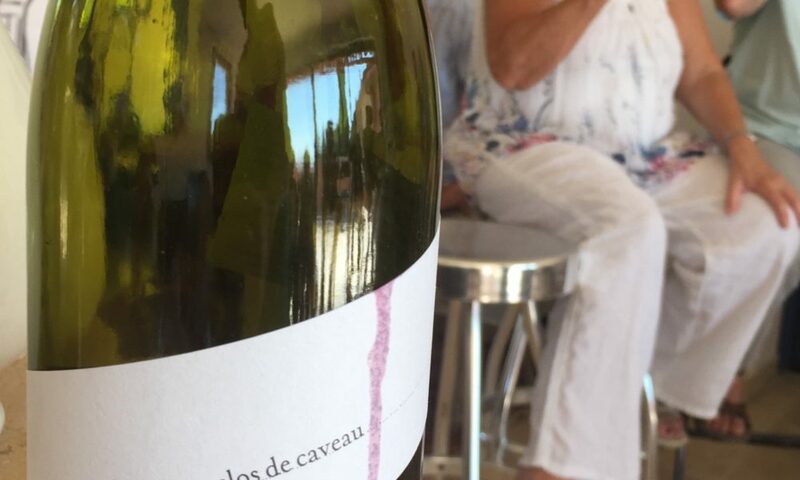 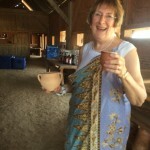 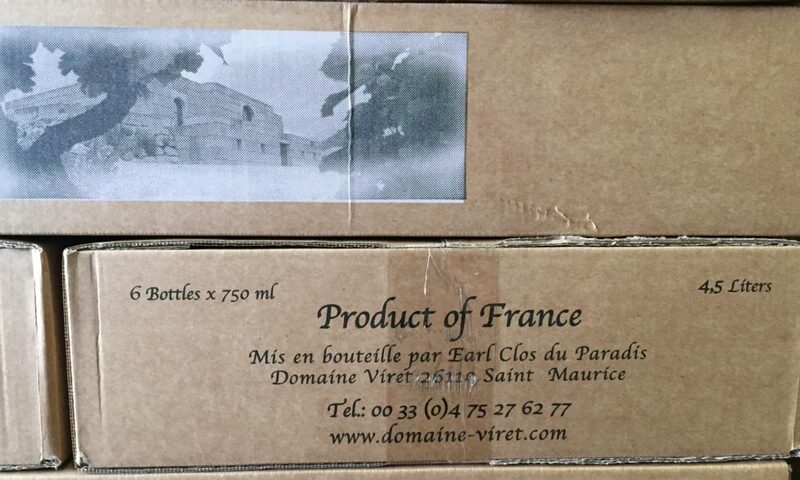 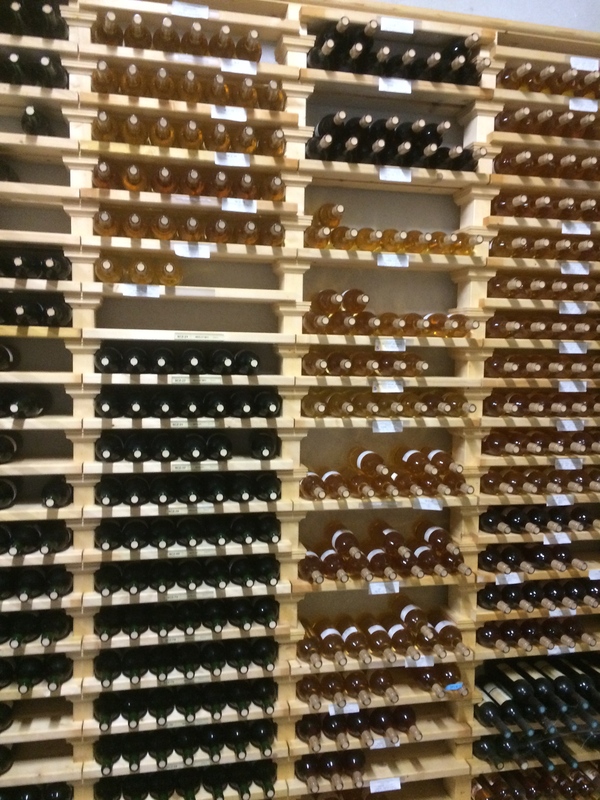 In a barn attached to a village house, she produces some really unusal wines – whites and reds, with wonderful depth and tonality. 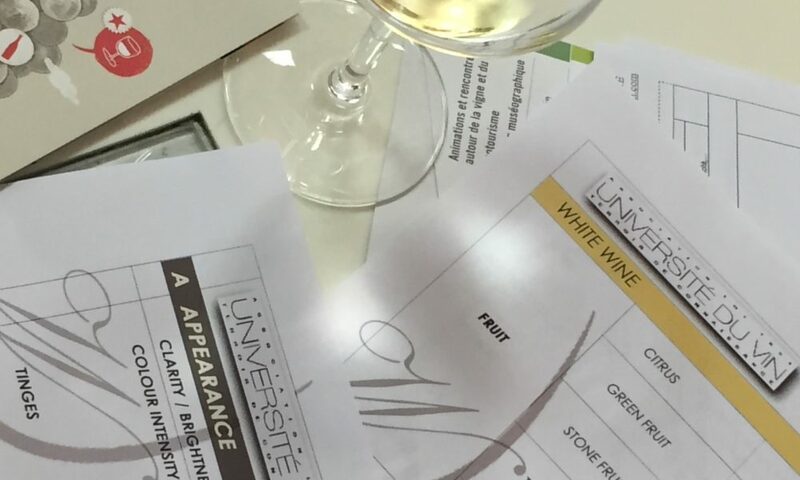 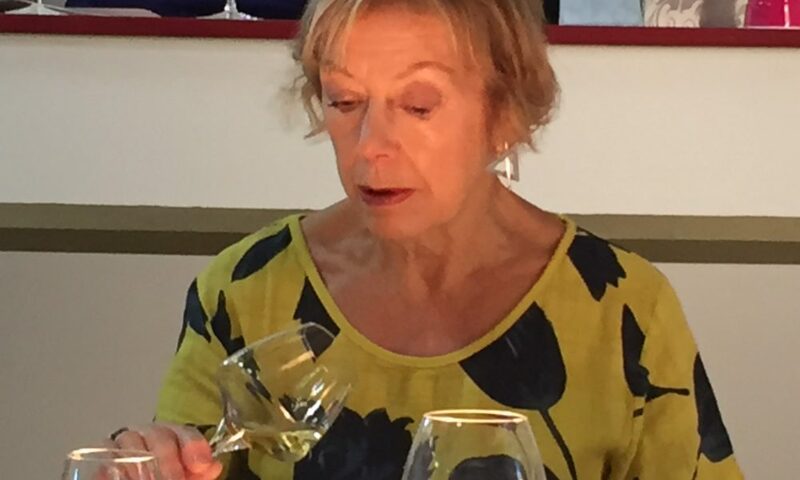 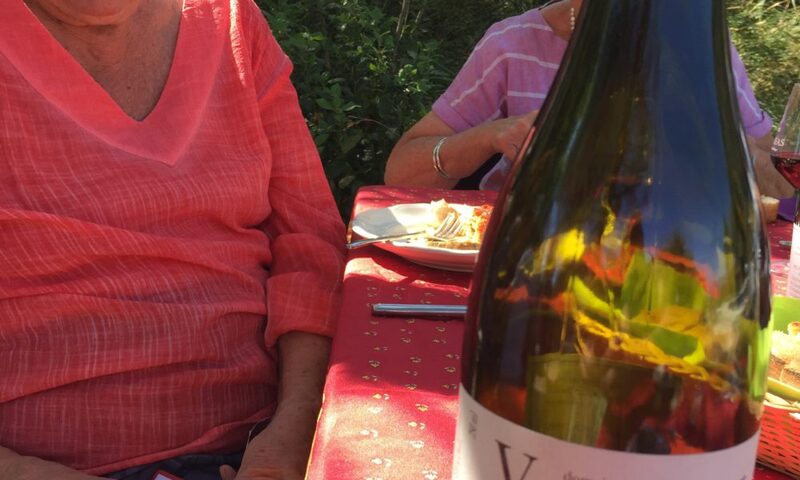 Some of her wines sell in michelin * restaurants – so we are not the only ones who think her wines are great. 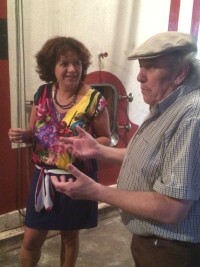 We left late afternoon and reflected on the hard work that Irène does to bring her wines to the table and the passion and dedication many winemakers have for their profession – these small winemakers certainly don’t do it for the ‘riches’ but to protect and carry on a tradition which is anchored into the fabric of French culture. 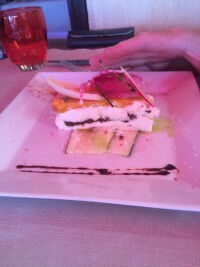 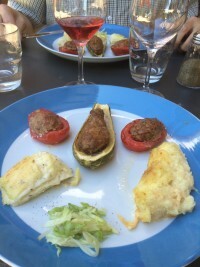 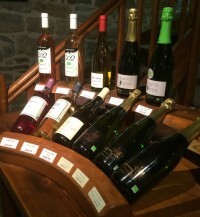 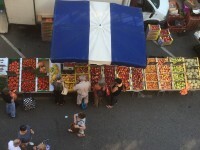 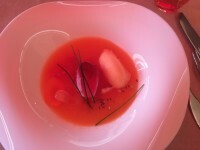 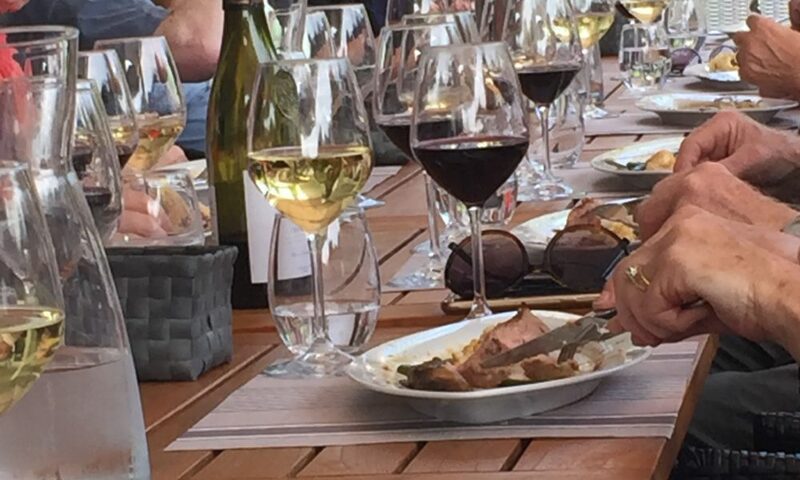 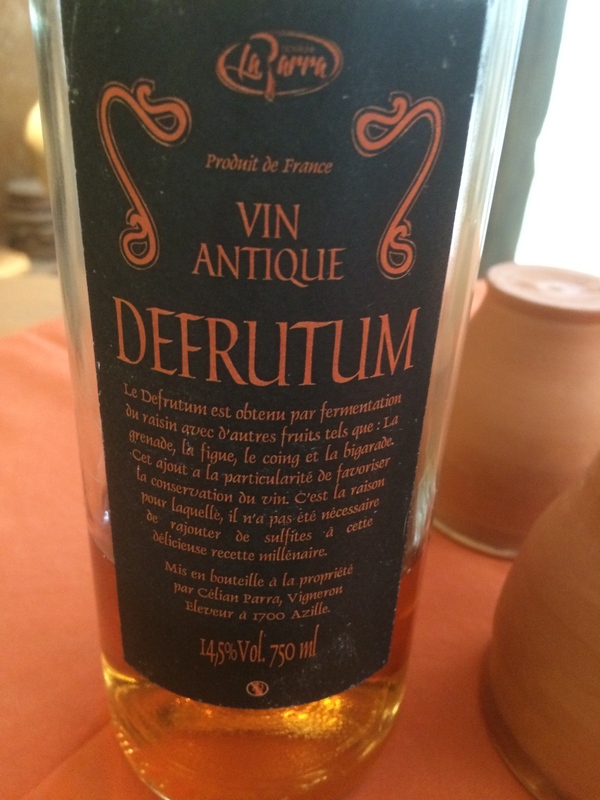 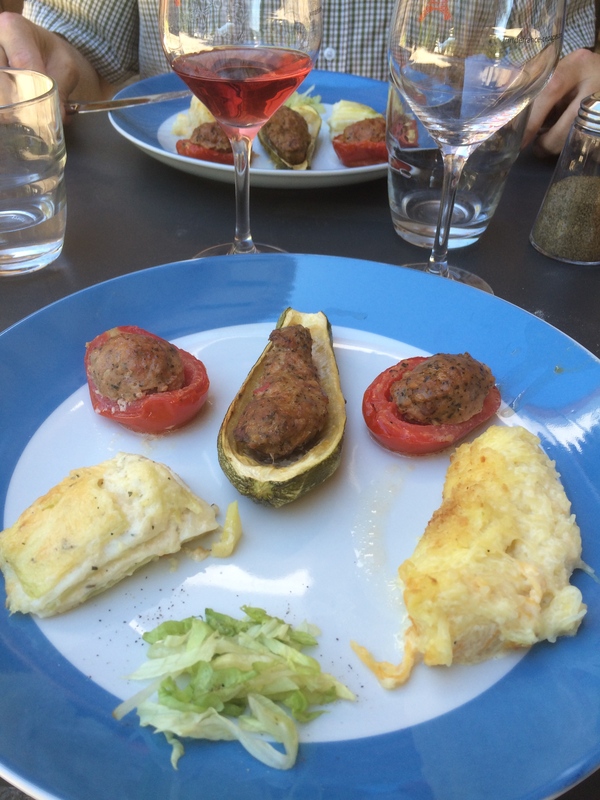 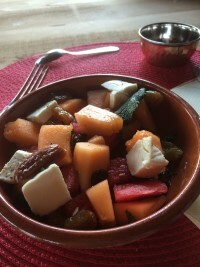 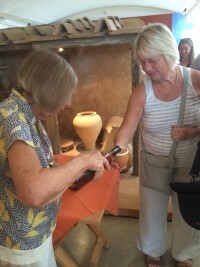 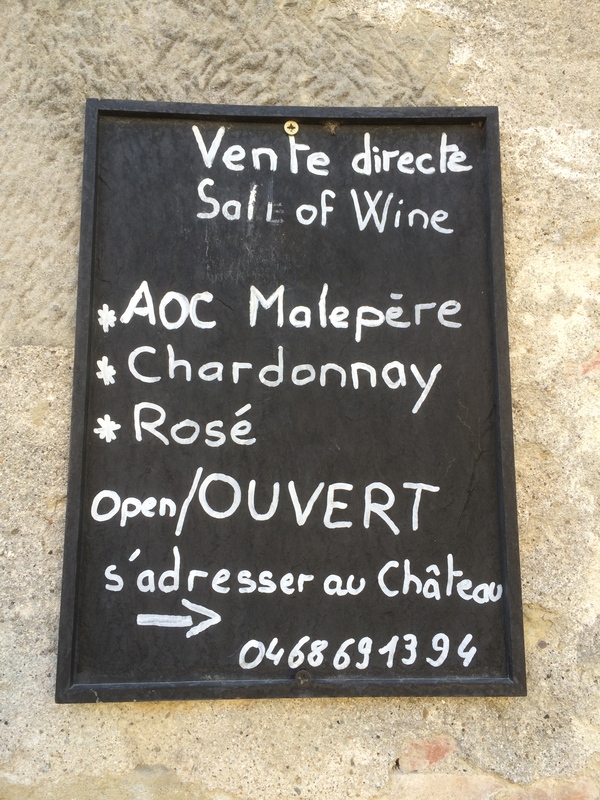 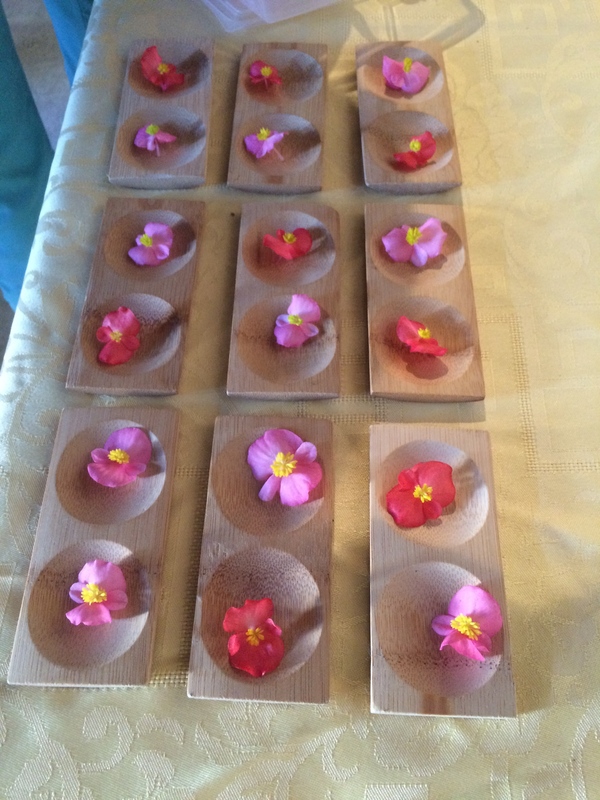 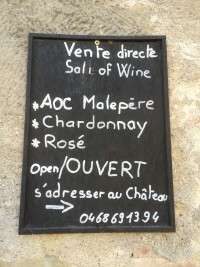 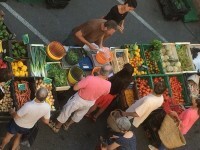 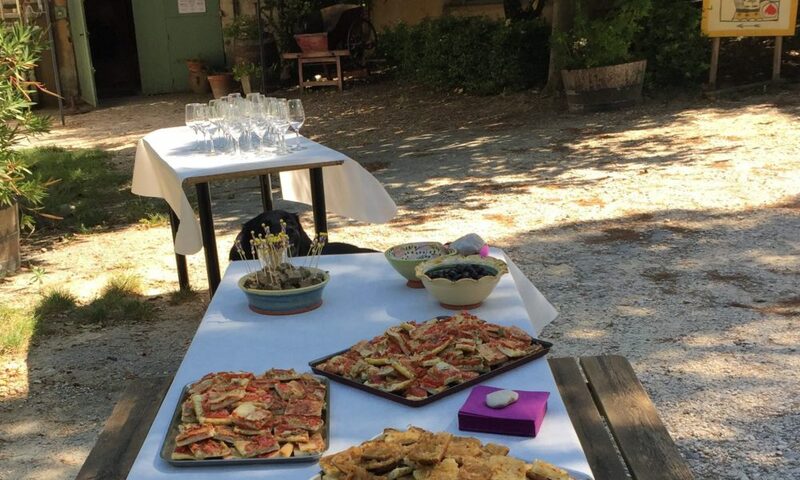 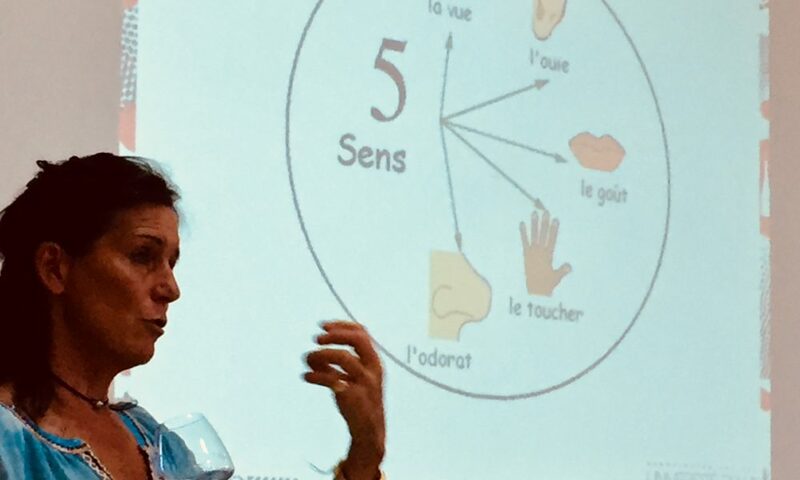 A relaxing morning and lunch in Limoux – friday is market day so lots to excite the senses. 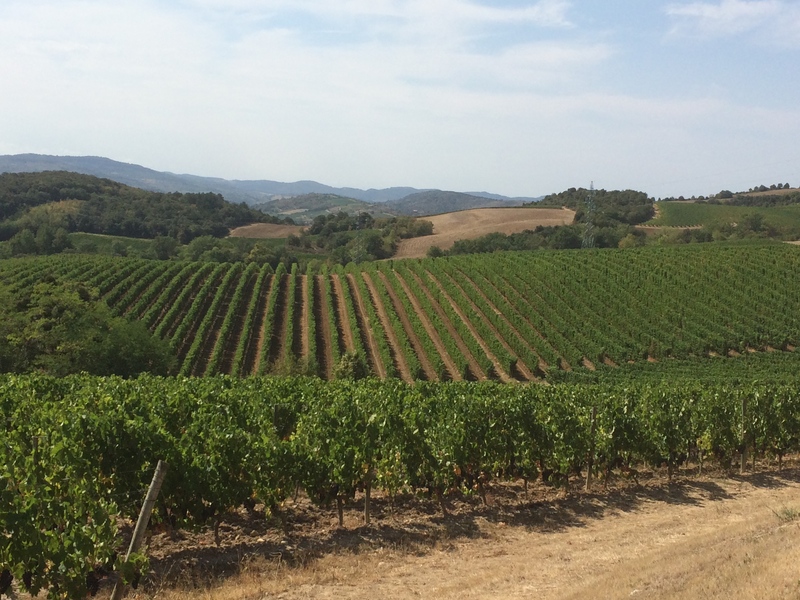 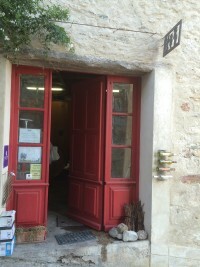 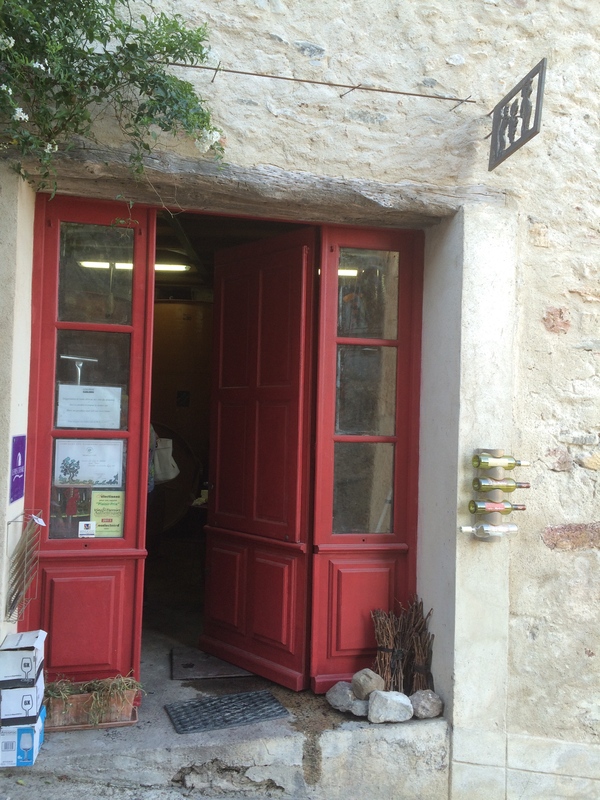 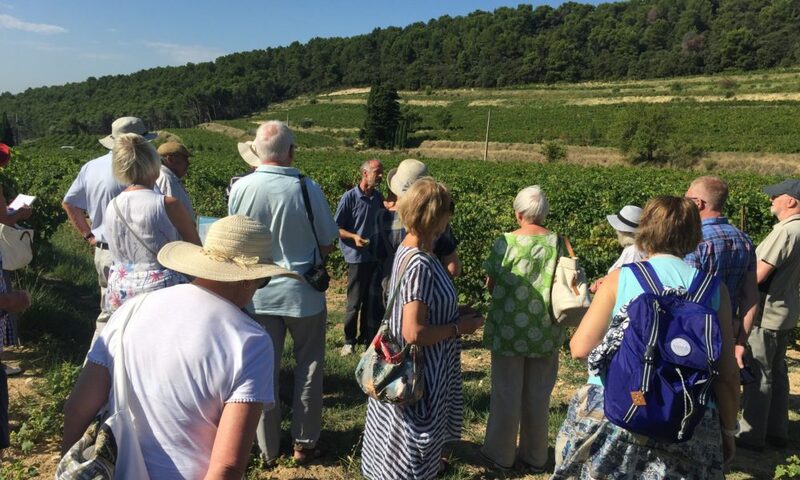 We head off after lunch to St Polycarpe – less than 10km from Limoux. 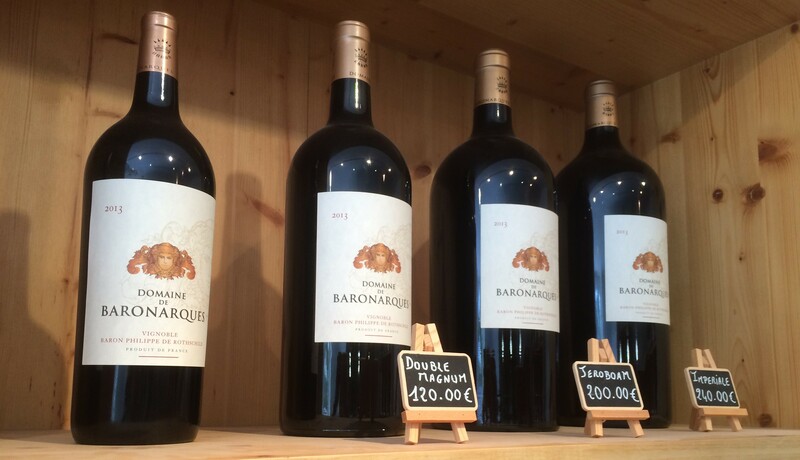 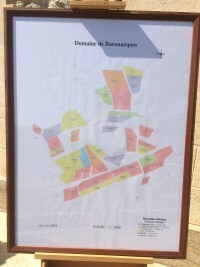 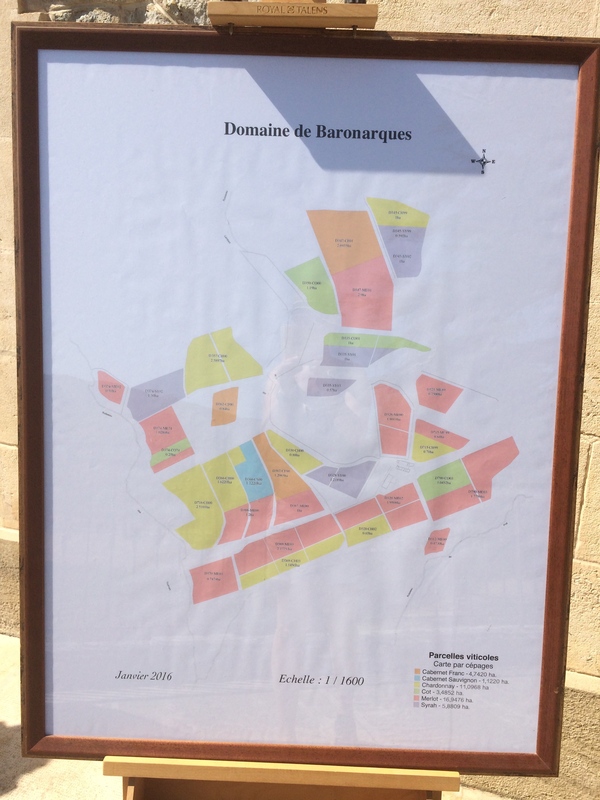 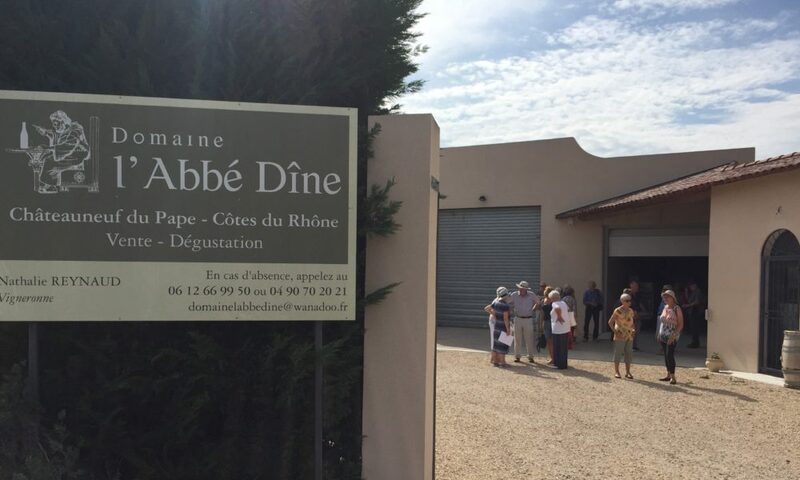 The impressive Domaine Baron’Arques, owned by the Rothchild family, certainly shows it’s pedigree. 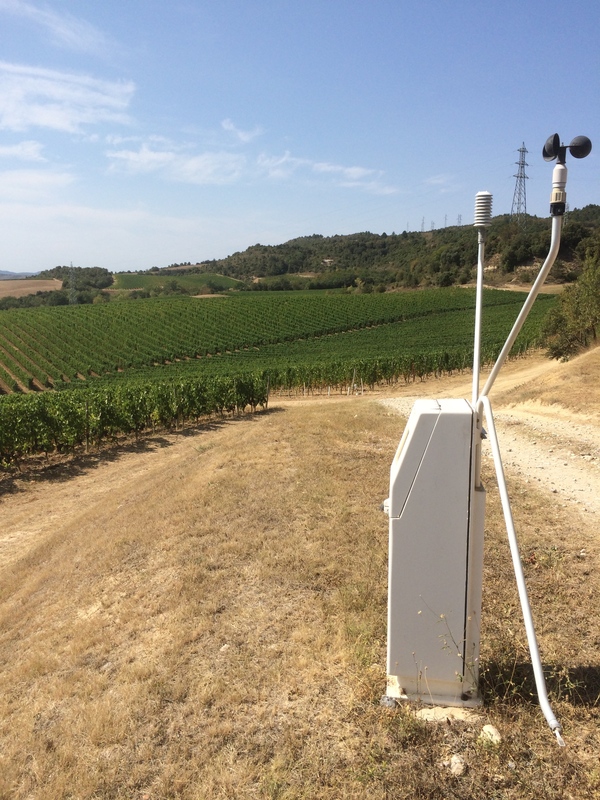 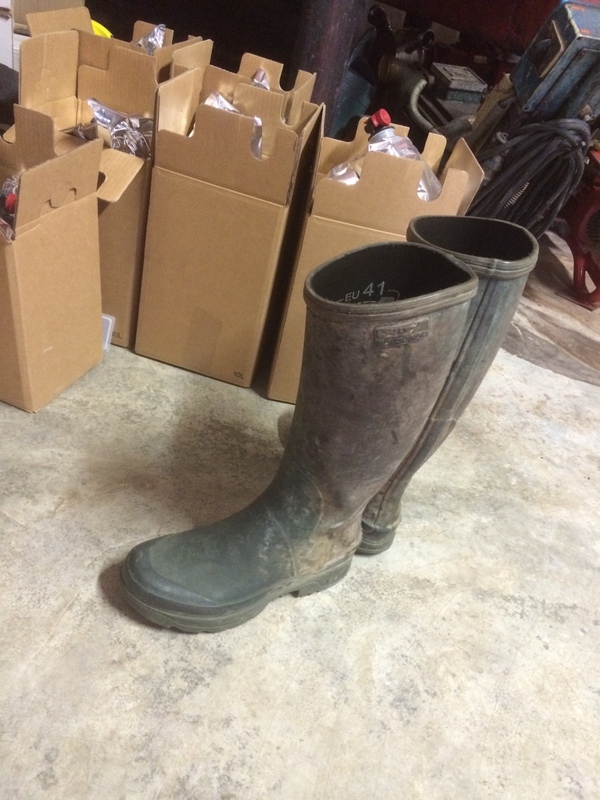 It’s own weather station, beautifully tended vineyards, well equipped tasting rooms all back up the Rothchild image. 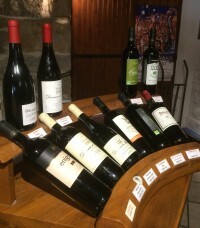 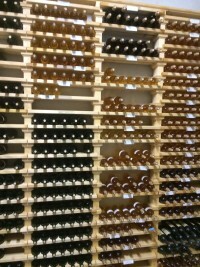 Of course the wines are wonderful (with prices to reflect all the investment!) 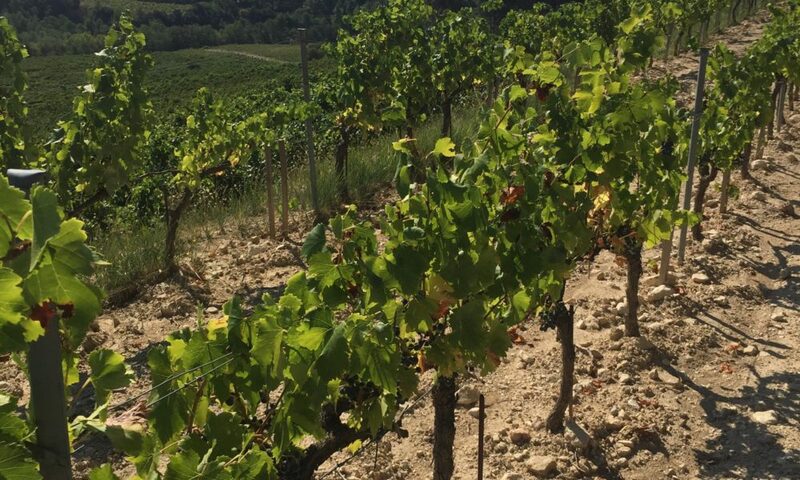 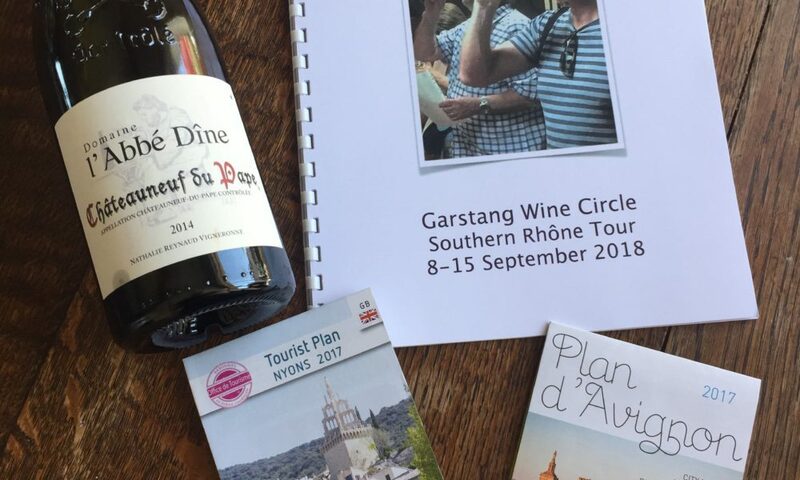 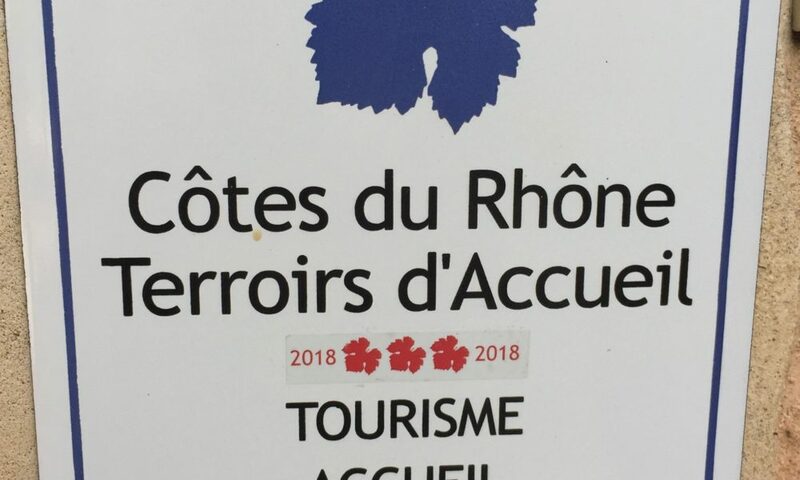 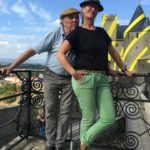 A short drive through rolling vineyards towards St Hilaire for a guided visit of this 15century Abbey and obligatory visitto the cellars where sparkling wine was first discovered in 1531. 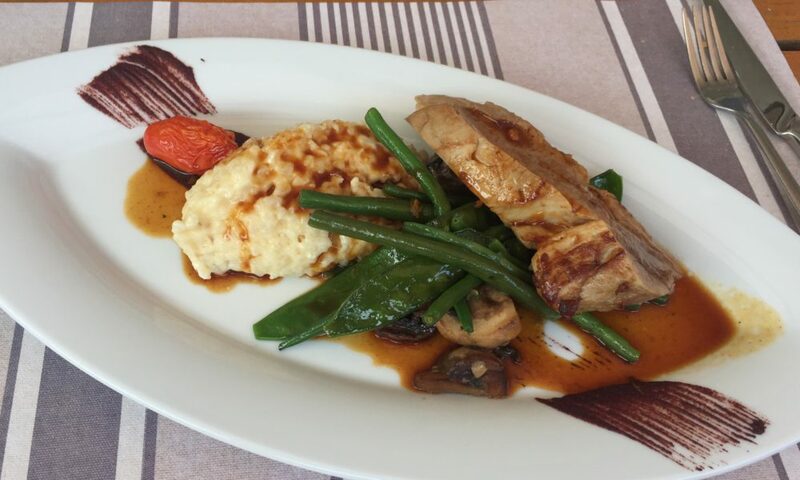 Next stop is completley different – one of our favourites. 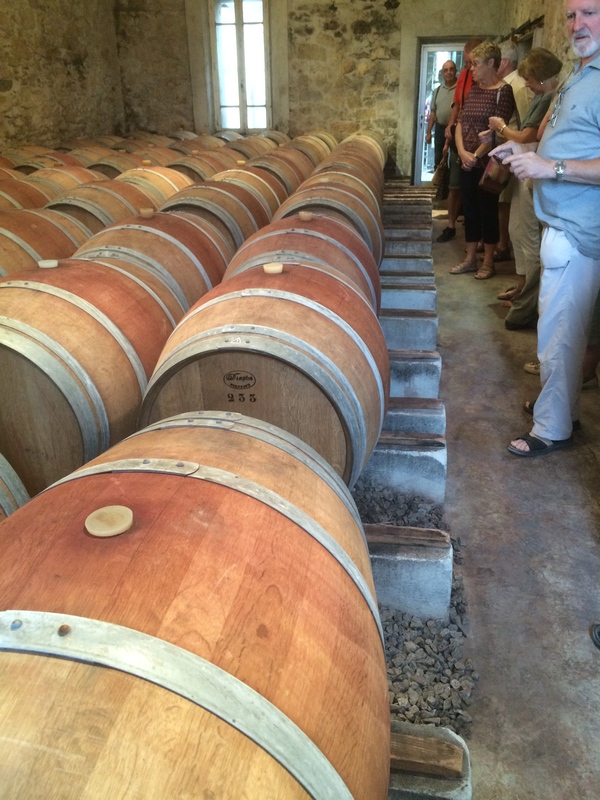 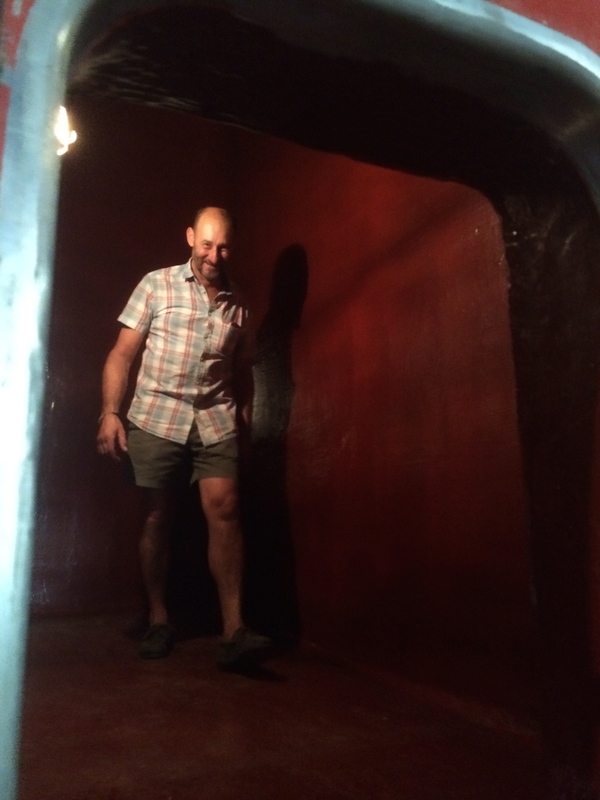 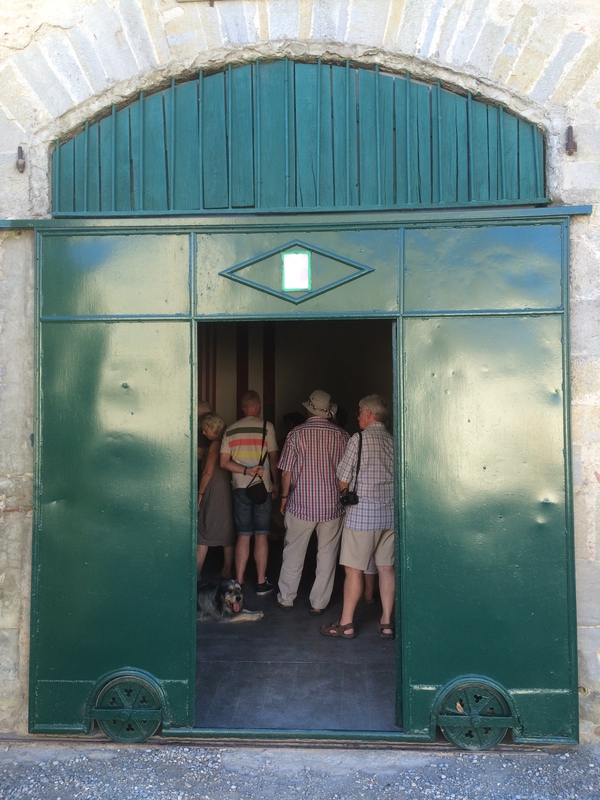 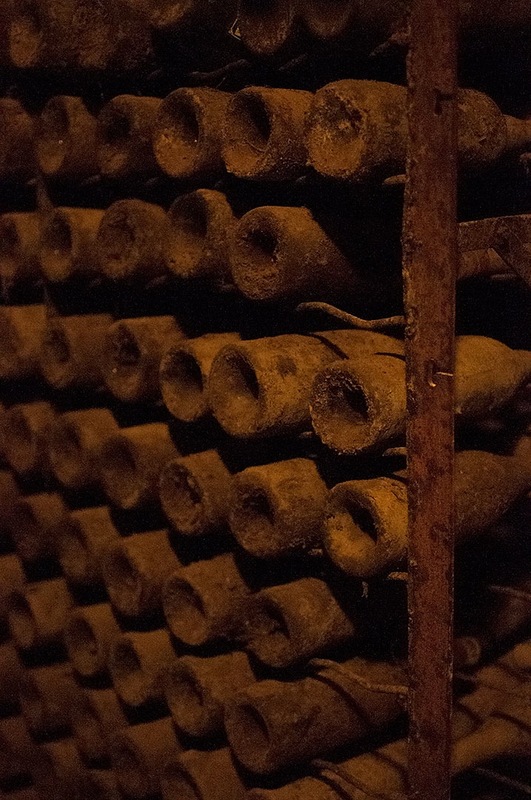 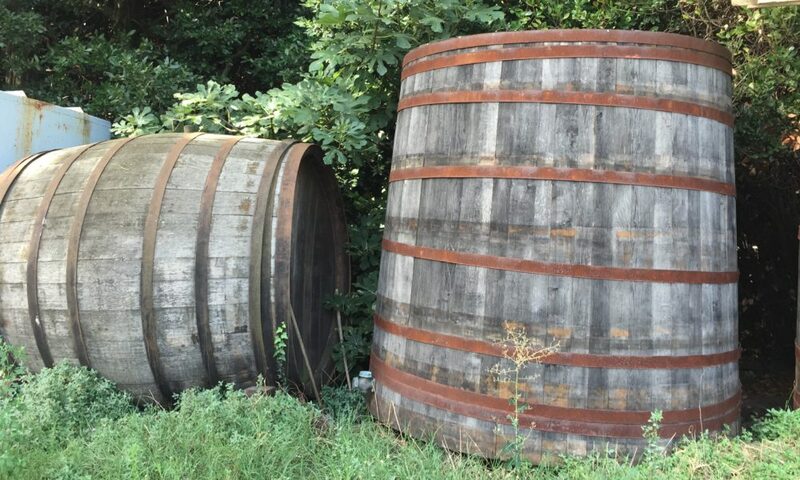 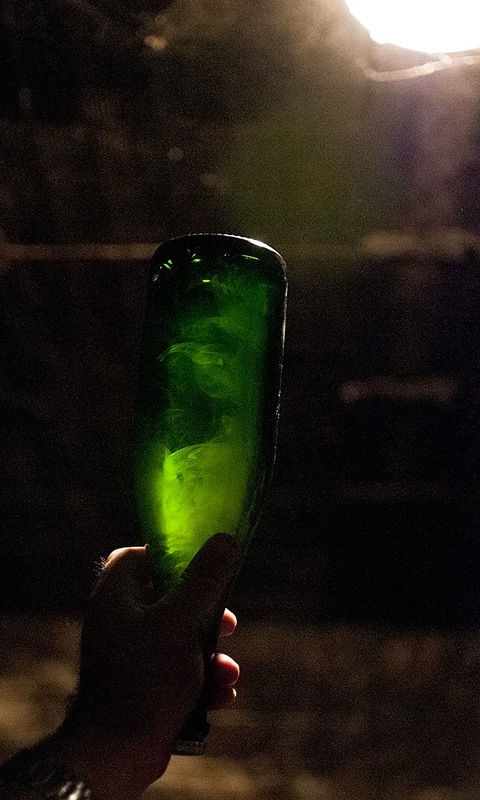 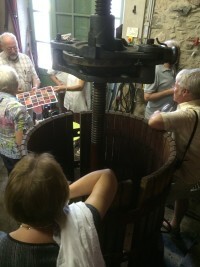 Domaine de Fourn, with its cobwebbed covered hand dug cellars – and one of our exclusive tastings. 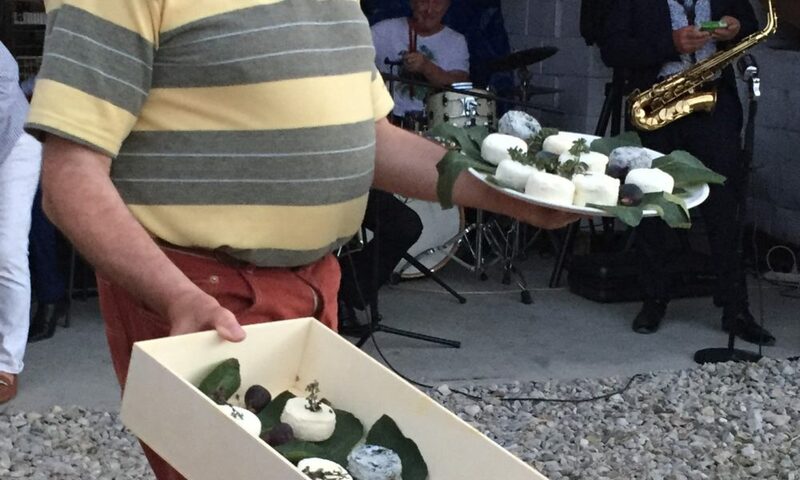 Over 10 vintage blanquettes and cremants are to be opened and discovered – going back to the 1970’s -all accompanied by homemade patés and other delicious nibbles. 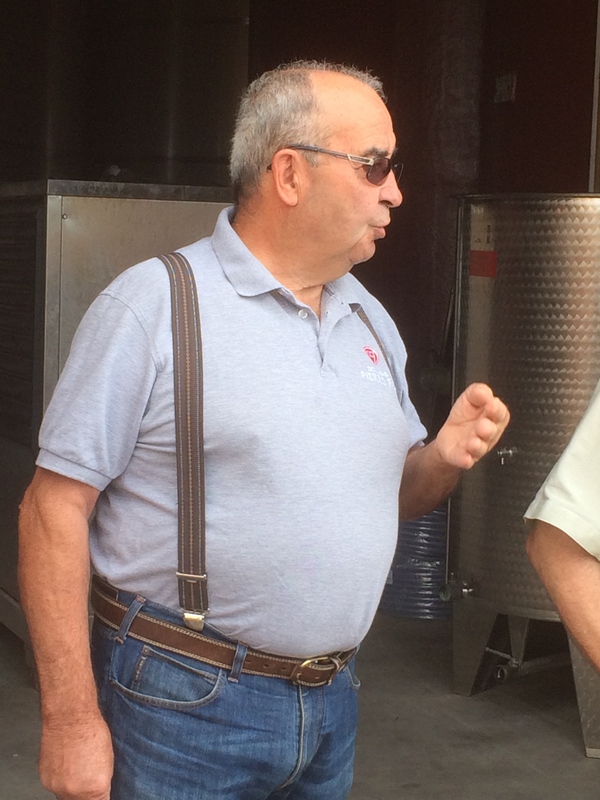 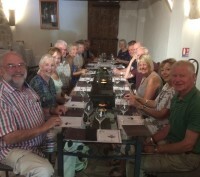 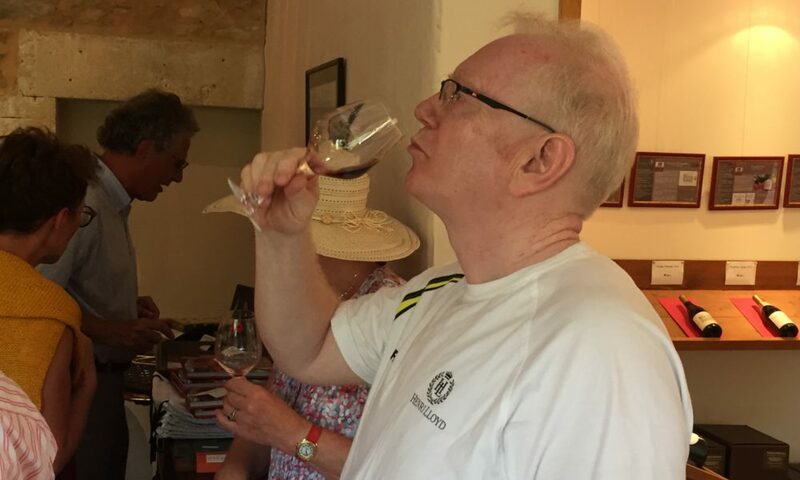 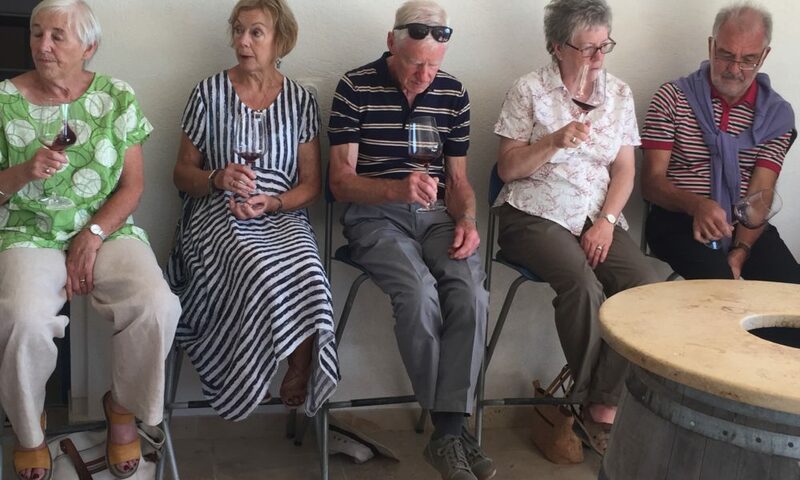 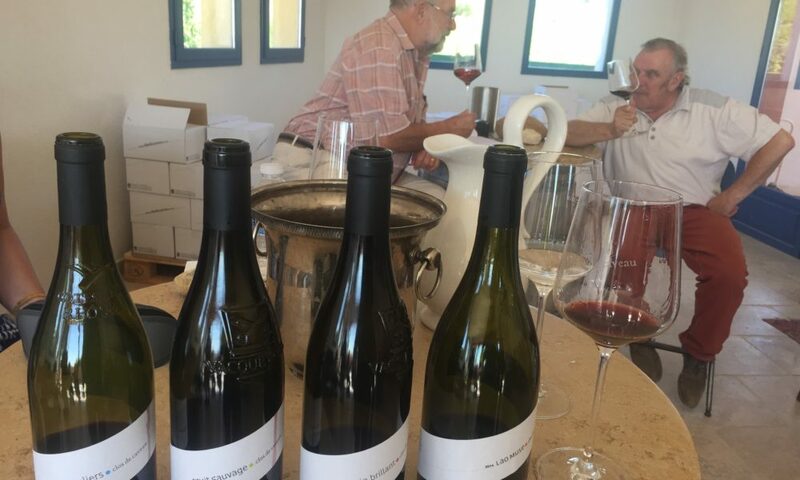 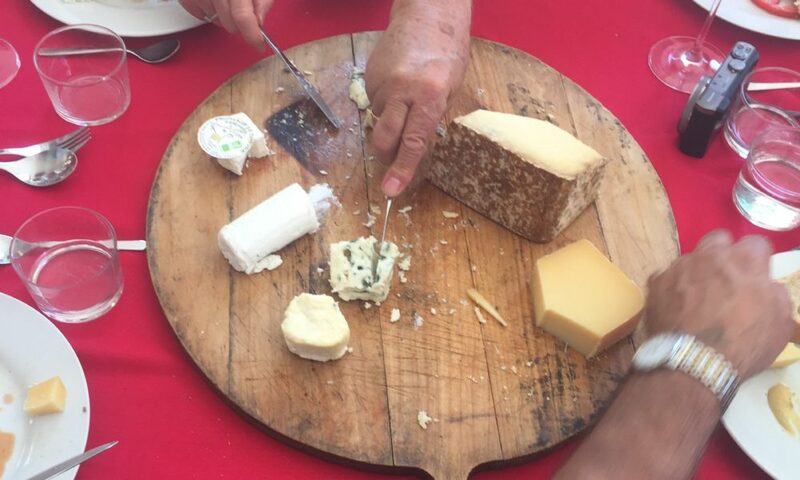 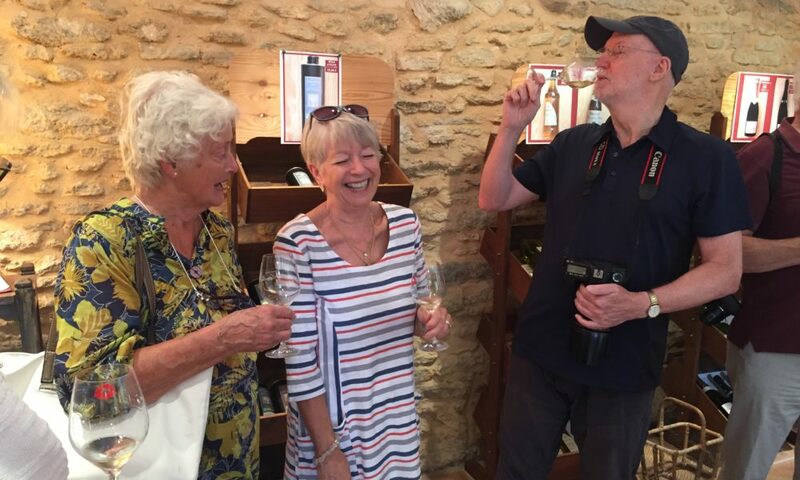 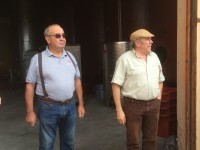 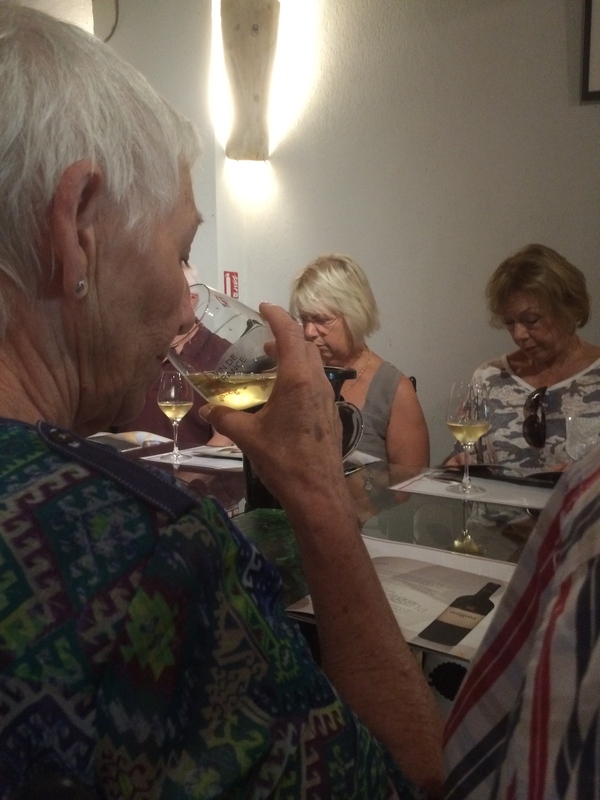 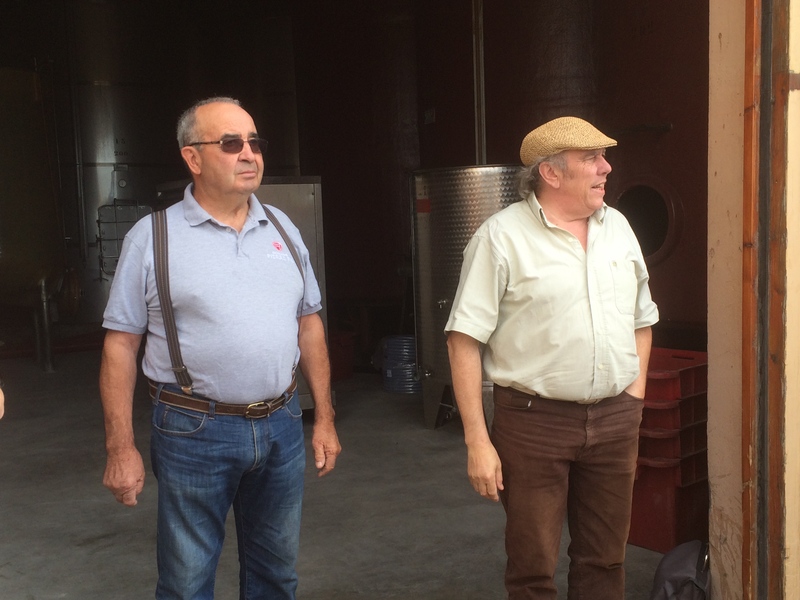 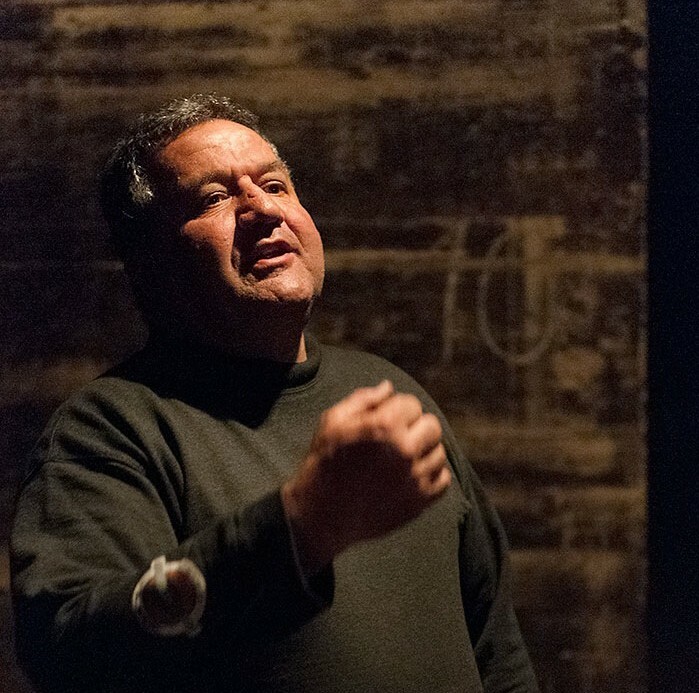 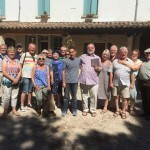 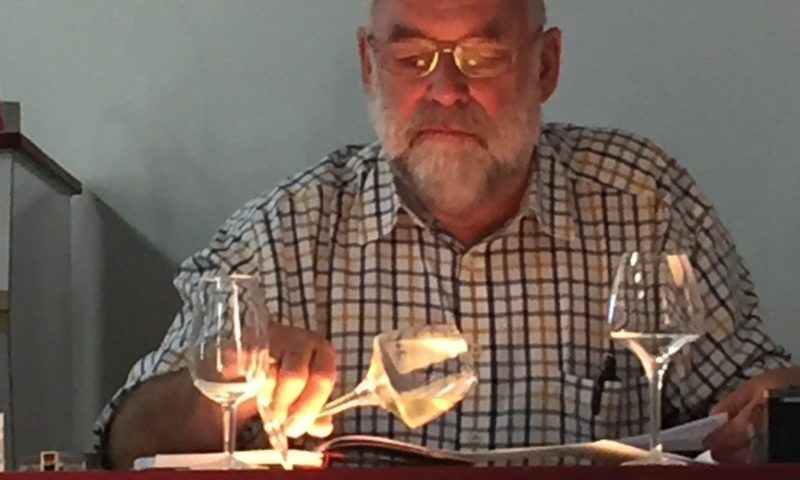 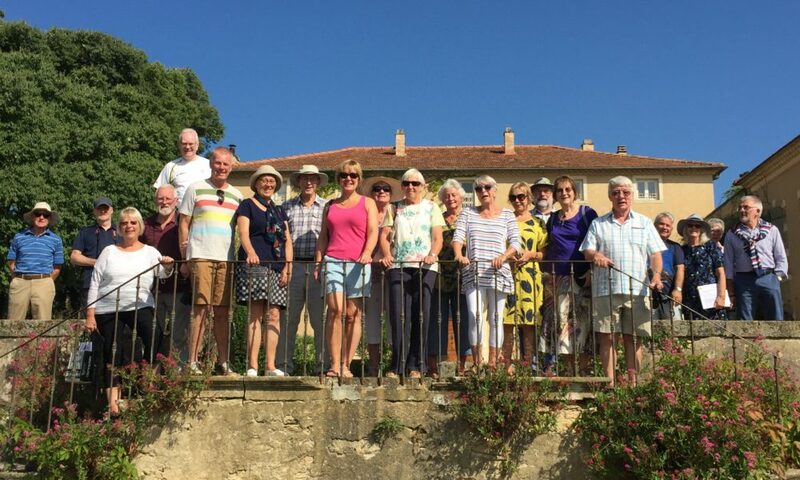 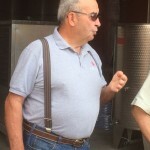 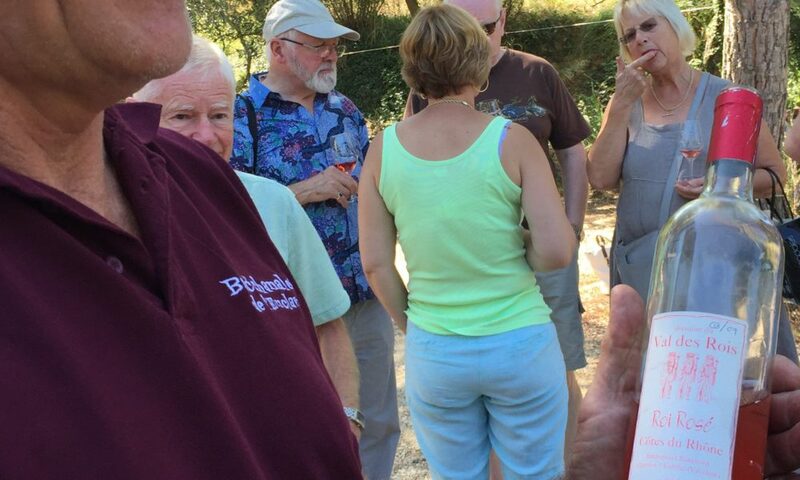 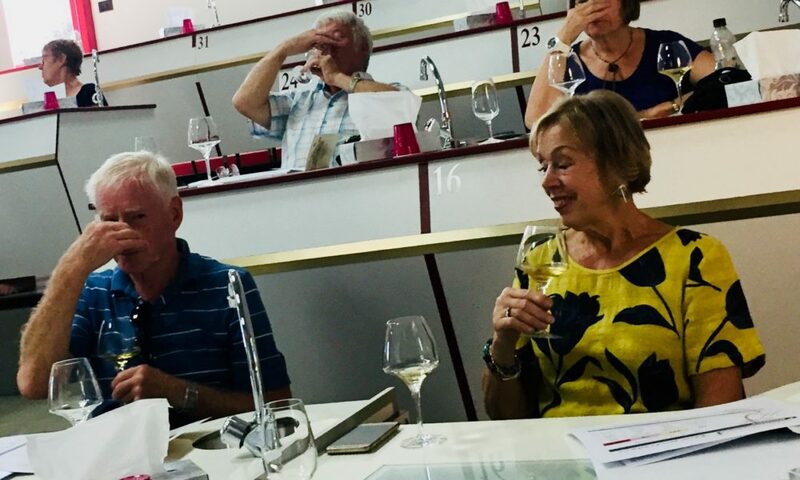 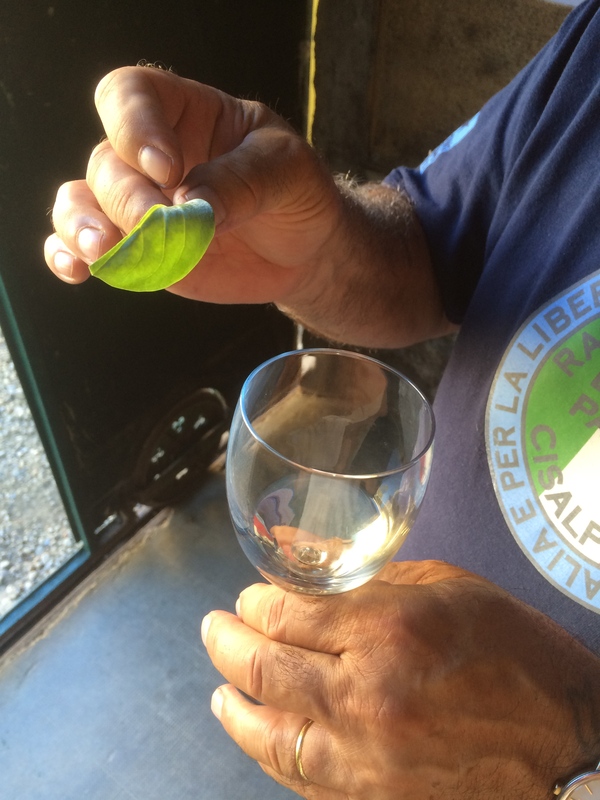 Our host Bernard – ex-rugby playing blanquette producer from 3 generations – is as always gracious and patient with his visitors and is amazed by the interest, knowledge and above all stamina of the group! 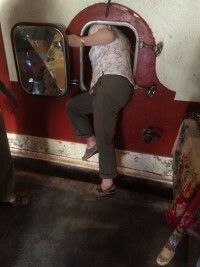 We roll out of there quite lateand luckily it’s only a short drive home! 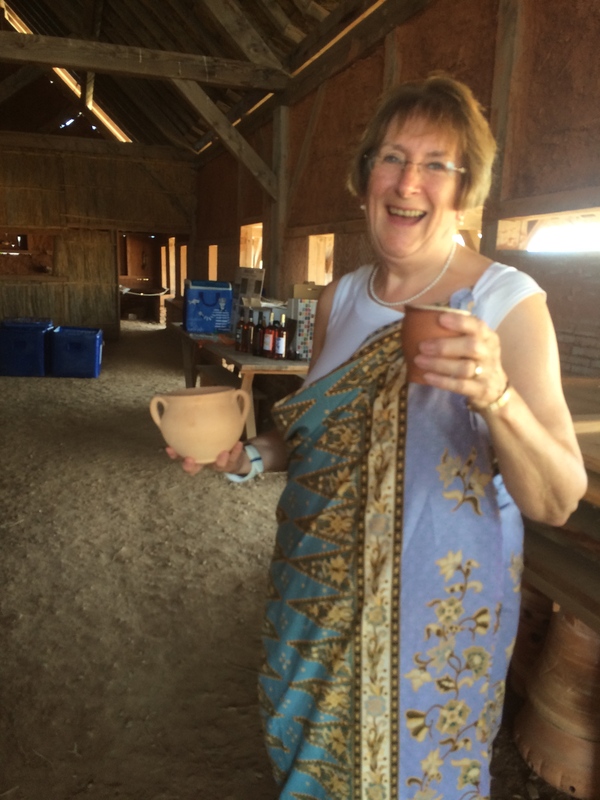 Jennifer chanelling her inner Roman woman! 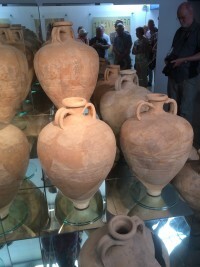 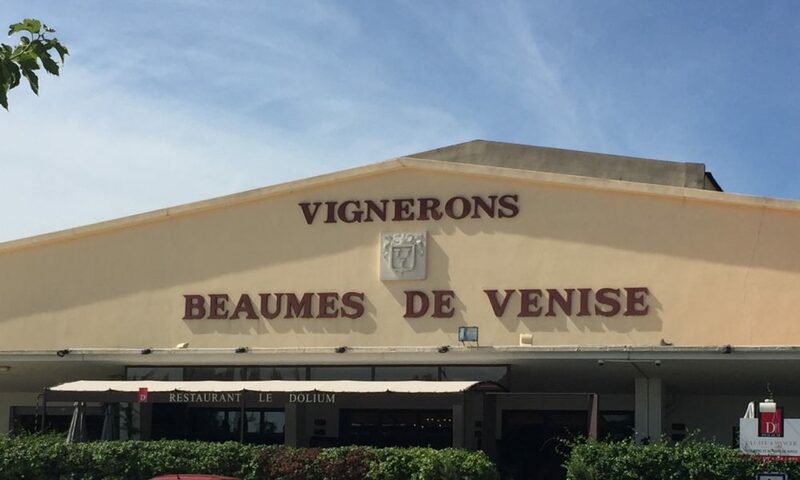 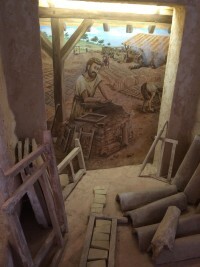 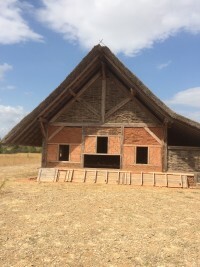 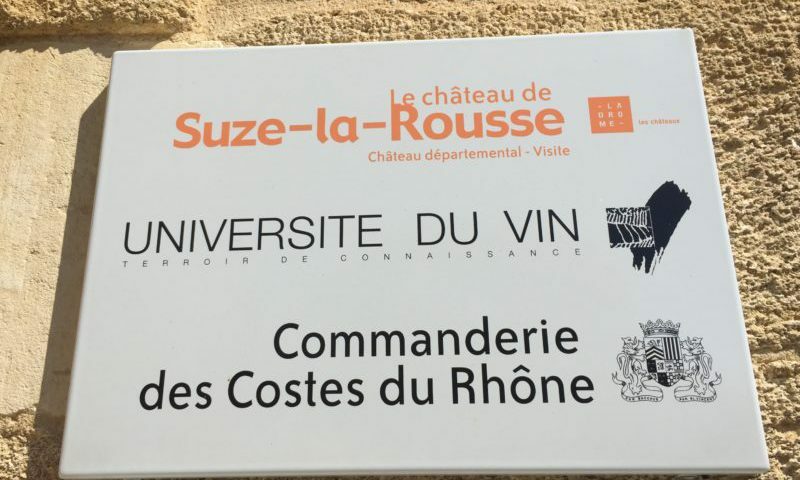 We called this day Roman as we visited an important site – the Museum of Amphoralis near Narbonne, where one of the largest industrial production of amphorae, roof tiles and household earthenware, was situated. 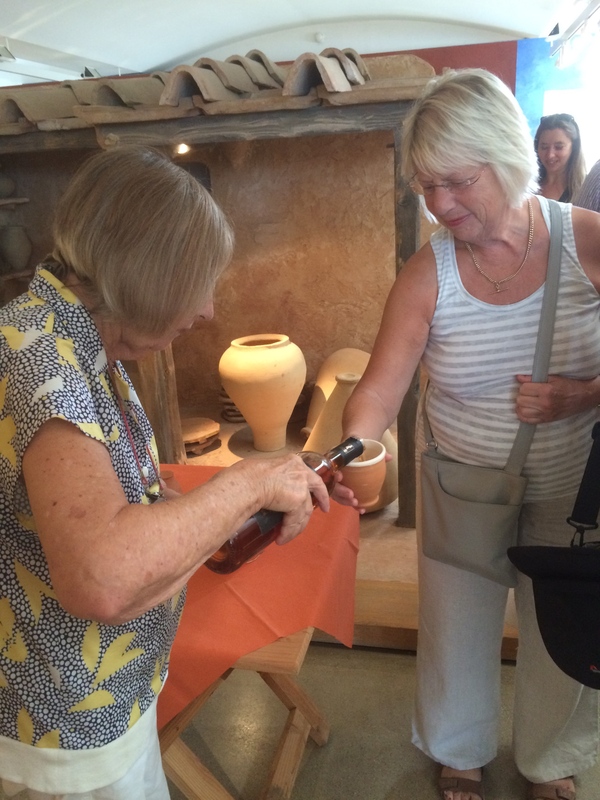 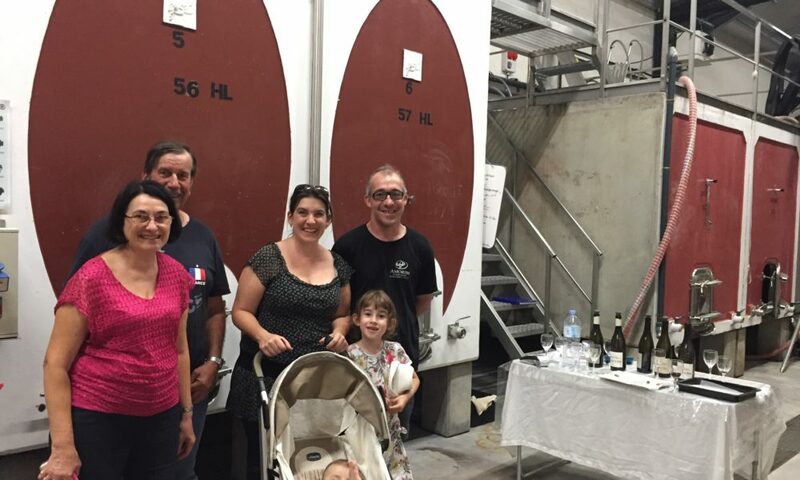 During out guided tour, we were greeted by Helène Serrano – a specialist in roman wine and her neice who actually makes wines to the traditional Roman recipes – vin antique as it is called. 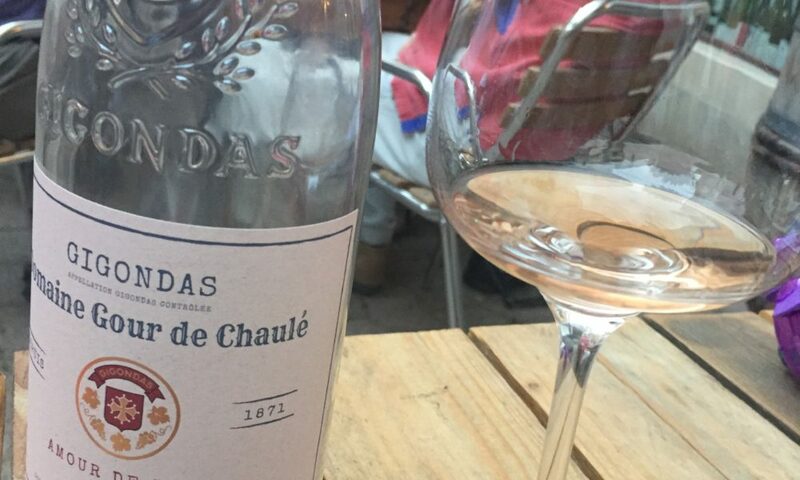 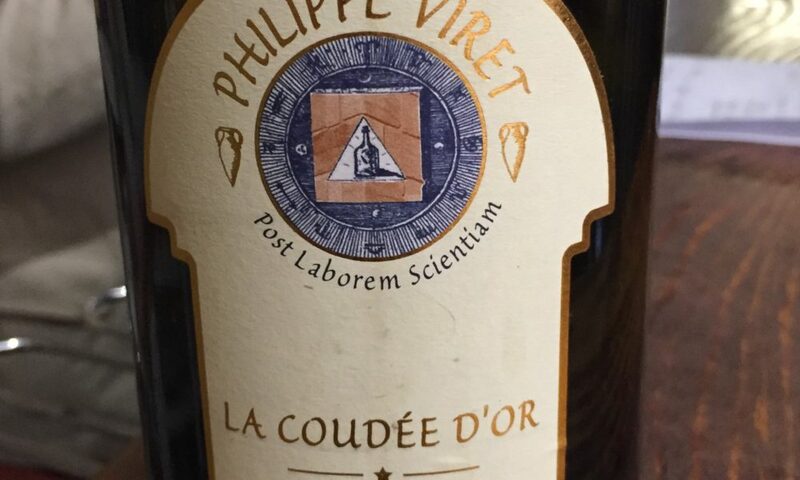 We tasted this wine in different areas of the museum, while learning all about the fascinating methods of production and why this site was so successful and important (natural resources of wood and clay, vineyards, naviagable waterways). 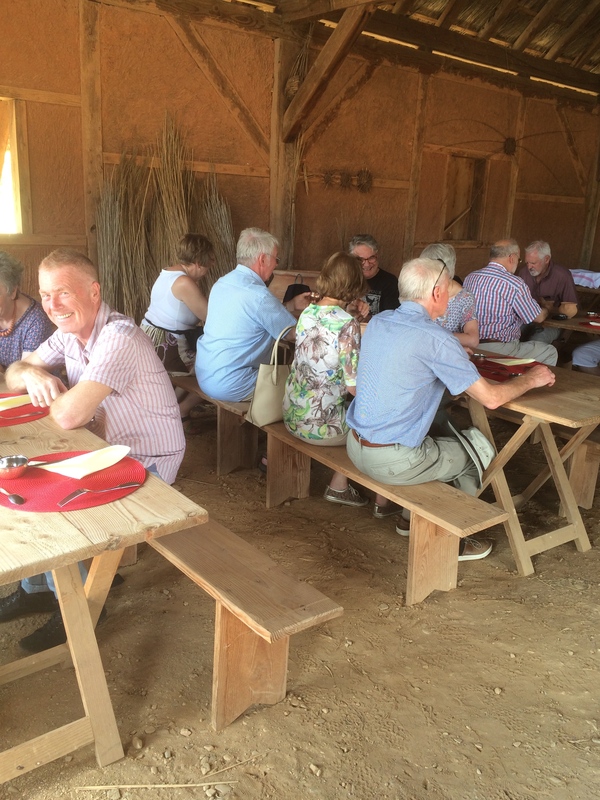 Lunch was in the reconstructed workers house and of course we had a Roman lunch based of real roman recipes of the day. 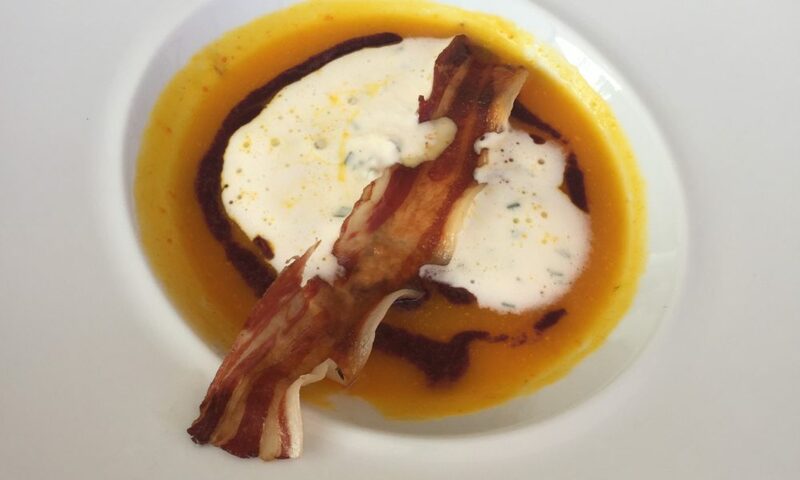 Romans used to eat alot of sweet and sour together and the main course of a game stew was flavoured with dried fish sauce, aniseed and other delicious flavours. 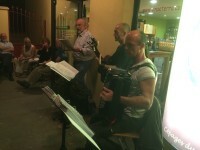 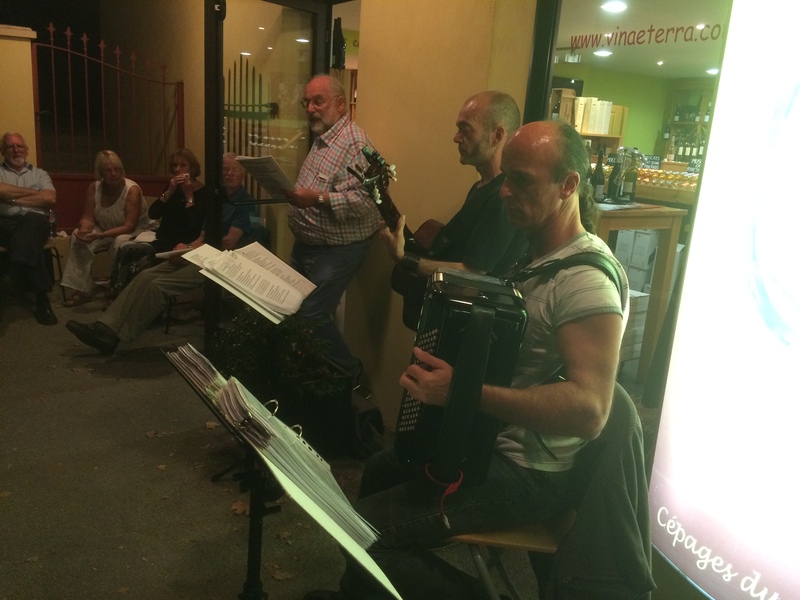 We returned to Limoux relataively early as dinner was at a local wine merchants, where we were entertained by friends of Jean-Luc – on accordion and guitar – with contributions from Jean-Luc on vocals and of course Richard who was itching to join in – he has wonderful tenor and singing in French poses no problems for him!. 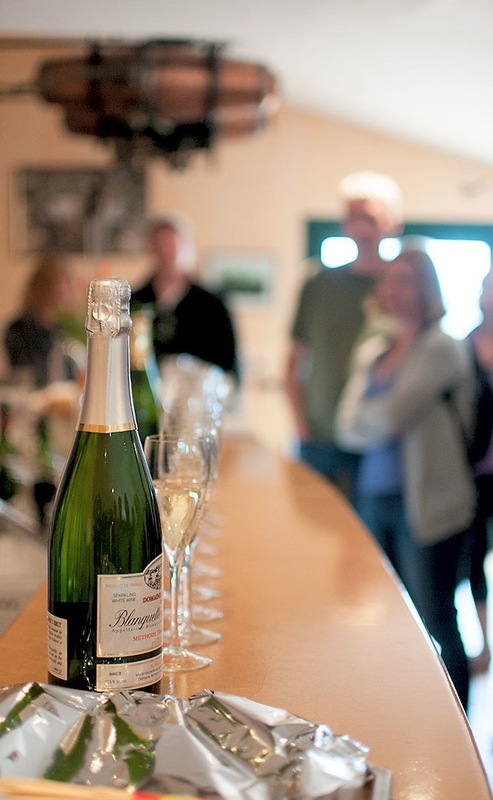 Dancing and singing all round, of course accompained by local wines and tasty canapés – another memorable day over. 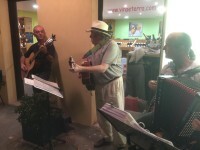 Jean-Luc joining in the singing too! 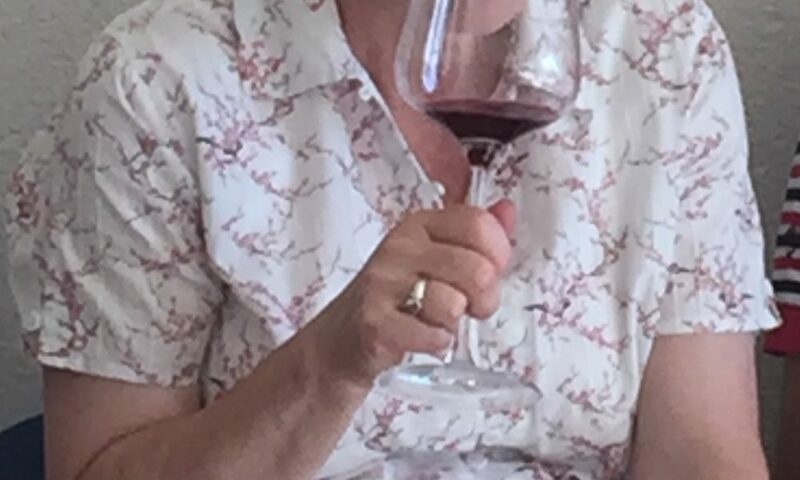 Is there any wine in there? 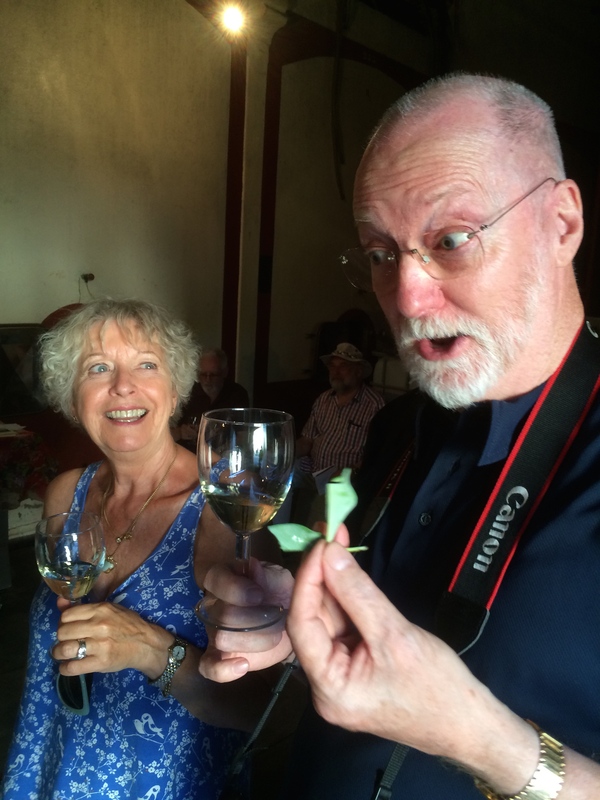 Gosh -these leaves do taste like oysters!